Not sure what design is perfect for your special day? If you’re looking for an exquisite wedding invitations supplier in Sydney or NSW, then peruse through our website and discover Giant’s beautiful range. Simply place a sample order of your top 5 favorite designs, and we’ll dispatch them straight to your door within one working day. Physical samples will give you an excellent idea as far as the stock, design and finishes are concerned; which will help you narrow down your perfect choice. Place your order with us, and we’ll also refund you the total amount of your samples. For your convenience, we’ve prepared the following collections – representing our best-selling range as selected by our Sydney brides and grooms. 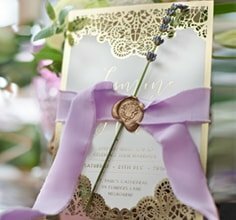 Discover Australia’s largest range of stylish, handmade wedding invitations and matching stationery items to beautifully encompass your weddings unique theme. What truly sets us apart, are our fully personalised invites and our talented design team. Our skilled designers will work with you to make sure your layout, colours and text are exactly to your standard, at no extra charge. Luxurious features such as hand assembly, silk- lined envelopes and gold or silver foiled seal stickers are also all included for FREE when you place your order with Giant Invitations. Our local Australian based customer service and design team will ensure your digital proofs are ready for proofing within one working day. Since we know just how stressful planning a wedding can be, we pride ourselves on offering the fastest turnaround on printing and hand assembly. You can expect your invites to be delivered in under 10 working days from placing your order, if you’re based in Sydney or NSW. We’re committed to maintaining the highest level of professional customer service to make the ordering process stress free. All of our friendly staff members are experts when it comes to helping our customers choose the wedding invite that’s perfect for their celebration. Your dedicated designer will communicate directly with you via the websites logged in portal or via email. Wanting to have a chat with them? Feel free to give us a call as well. For your total peace of mind, you’ll also be provided with a secure login where you can view all of your digital proofs, to ensure that you are 100% satisfied with the layout before we proceed with the printing. Our specialised Sydney team are working hard to ensure that your ordering process is the most stress-free element of your planning. Our friendly staff can help you with all enquiries whether it’s just a shipping query or a custom wedding invitation design.